Preheat oven to 120 C and line two baking trays with some baking paper. Draw a large circle (25cm in diameter) on each piece of baking paper. Gradually add sugar, one tablespoon at a time, until the sugar dissolves and the mixture is thick and glossy. Divide mixture evenly between trays and spread with the back of a spoon until they’re an even thickness. Bake for 50 minutes, swapping shelves half way, until mixture is dry and crisp. Turn the oven off but leave meringues there for one hour, or until completely cooled. Combine berries in a large mixing bowl. Beat cream with electric beaters to soft peaks. 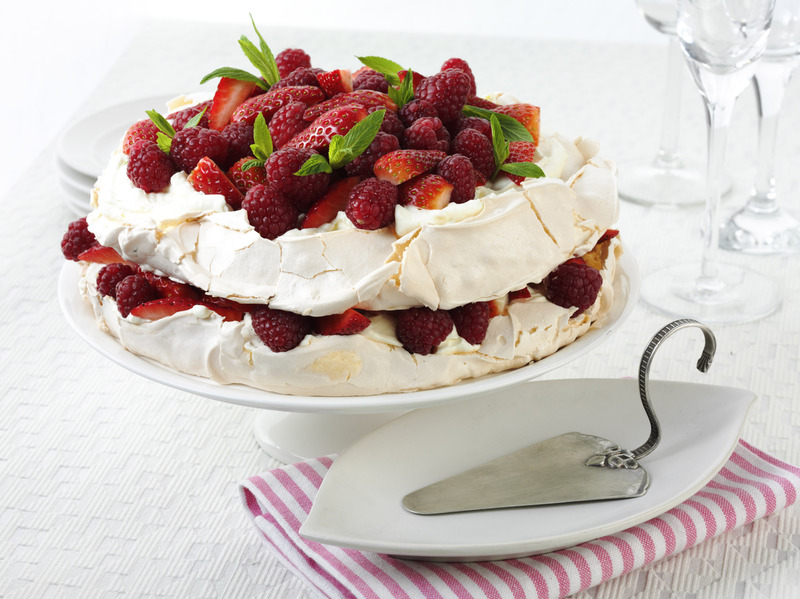 Place one of the meringue discs onto serving plate and spread with one third of the cream. Scatter one third of the berries on top of the cream and place remaining meringue on top. Spoon the remaining cream on top and pile on the berries. Garnish with mint leaves and serve.